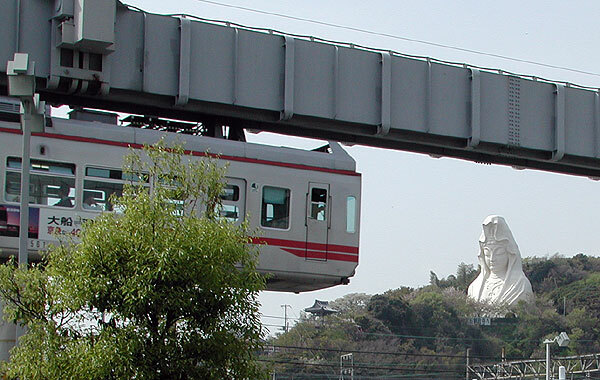 Welcome to Ofuna, Japan and the Shonan Monorail! 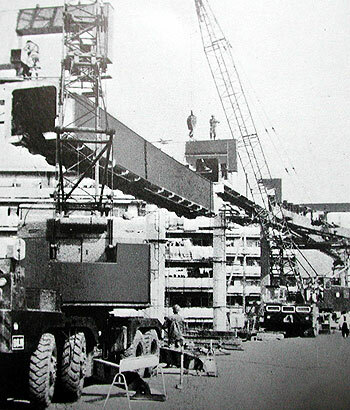 We're pleased to present this photo essay of what was the world's first transit line to employ the French-developed Safege suspended monorail technology. The alignment was ideal for Safege, with a narrow corridor and hills to negotiate. 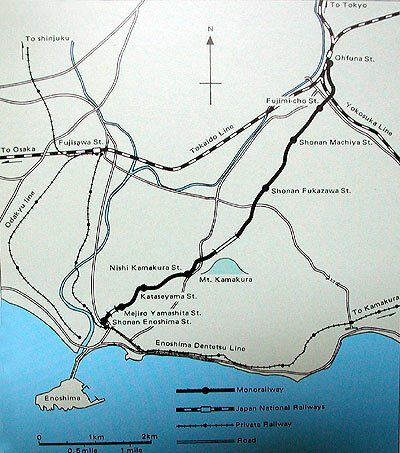 The Shonan Monorail was Japan's first new monorail built after the Tokyo-Haneda system opened in 1964. 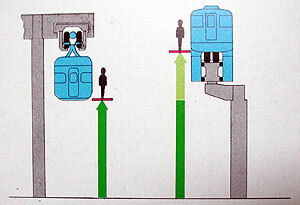 In this Mitsubishi diagram, Safege platform heights are compared to Alweg. Alweg backers would probably highlight the fact that taller supports are required for Safege all along the corridor. But then Safege fans would say, the guideway is completely protected from the elements and can run in the most severe winter conditions. The debate continues, but the truth is that both systems are ideal for many applications. This interesting diagram shows how Safege could be part of an elevated road structure. On to the pictures! Here we see a three-car train departing Ofuna Station. As we like to do in our essays, we'll follow the line from one end to the other. 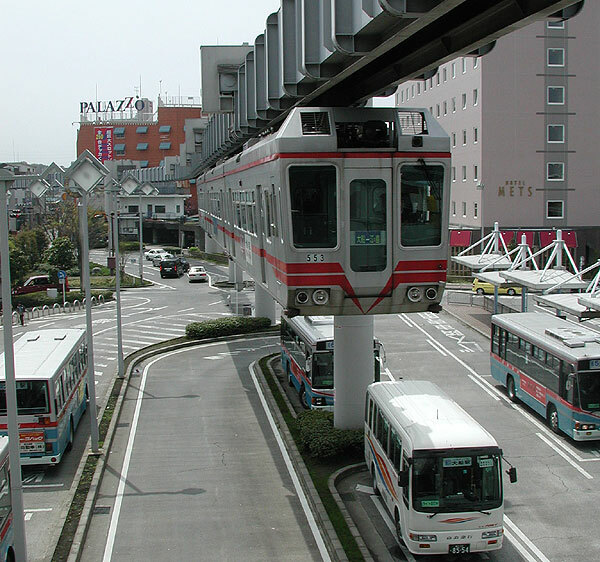 The Ofuna Station is a multi-modal station where buses, taxi, urban rail lines and the Shonan Monorail meet. Here's the comfortable interior of one of the trains. 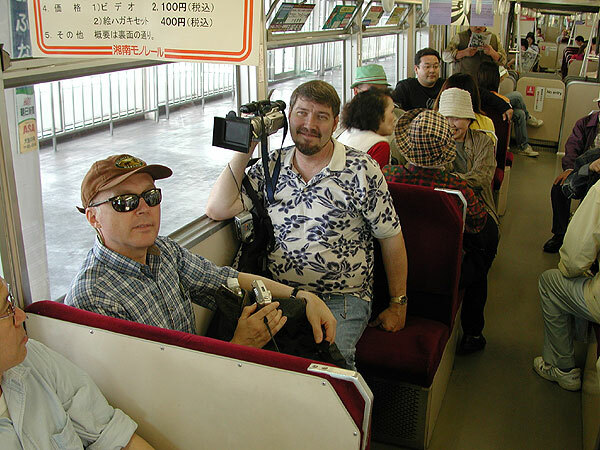 Seated are Ken Streit and David M. Ice, who accompanied yours truly when The Monorail Society visited Japan in 2003 to document monorails.